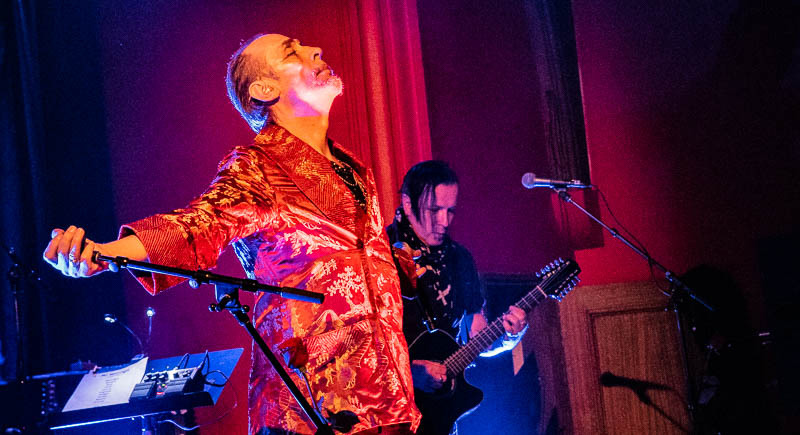 Peter Murphy, the vampire baritone who catapulted to cult stardom during his tenure as the fiery front man of legendary underground death rockers Bauhaus finally made it to the stage at The Chapel in San Francisco. After re-scheduling his dates at the Valencia St. music hall three times over the past 18 months due to a series of health and visa issues, Murphy actually touched down in the bay area poised for a monthlong residency. The plan was a series of shows to celebrate his 40-year career spanning the early Bauhaus days through his rich solo catalog. While in theory the plan sounds like an absolute winner, the opinions of Murphy’s execution of the plan are about as unpredictable as the man’s ability to make it to the stage to perform. Case in point, Murphy did not make it to the March 5 opening night of the residency. Even though his band was set up and ready to go that night, Murphy was reportedly stuck at LAX Airport, and thus unable to perform. Let the inconvenience parade begin. 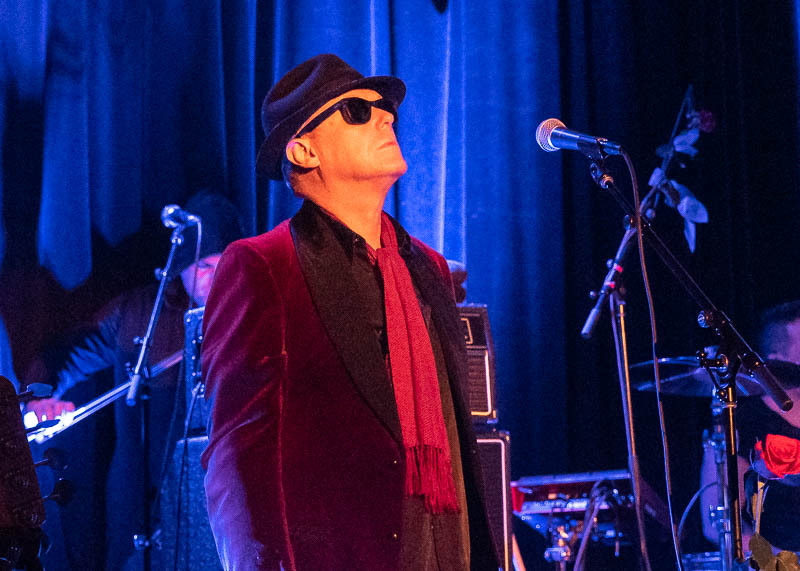 The Chapel had to once again make last minute apologies to fans about Murphy’s inability to play, leaving the venue with an empty stage, and fans (many of whom had travelled a distance and booked hotel rooms) with worn patience. Fast forward a couple of weeks, and we find Murphy mid-residency with several shows under his belt. Reports to this point have been a mixed bag, with Murphy experiencing some voice issues which (depending on how he felt) affected set length for a given night’s show. Being that this evening’s show was one of the ‘Mr. Moonlight’ Bauhaus retrospective shows, there was a spark in the air, and the energy in the room was high with the anticipation of live rock electricity. With bassist David J in the house to join Murphy in playing the Bauhaus hits they made famous, this had the promise of an epic show. 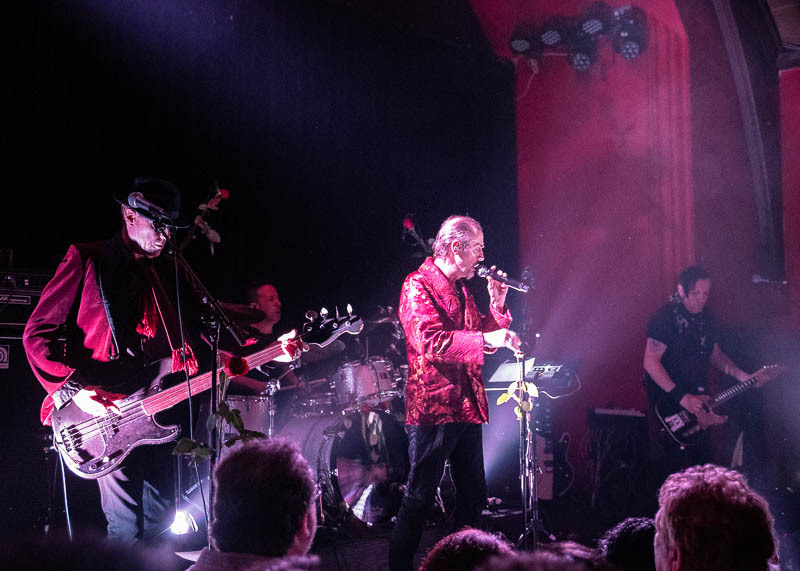 Taking the stage with guitarist John Andrews and drummer Marc Slutsky, David J and the band warmed up the crowd by starting into ‘Who Killed Mr. Moonlight.’ Suddenly as if appearing out of thin air, Peter Murphy was at the foot of the stage, and joined J…the crowd erupted. On cue the band commenced the dark gypsy swing of ‘King Volcano,’ with Murphy belting out the vocals in his hauntingly, plaintive low drone. Propelled by the heavy thump of David J’s overdriven bass, the room felt like it was leaning sideways with Murphy hanging off the edge of the stage serenading the crowd while giving hand slaps and his signature shoulder shimmy to those in the front. This was what we have been waiting for these past 18 months. This is why fans endured the past disappointment of postponed shows and kept coming back. 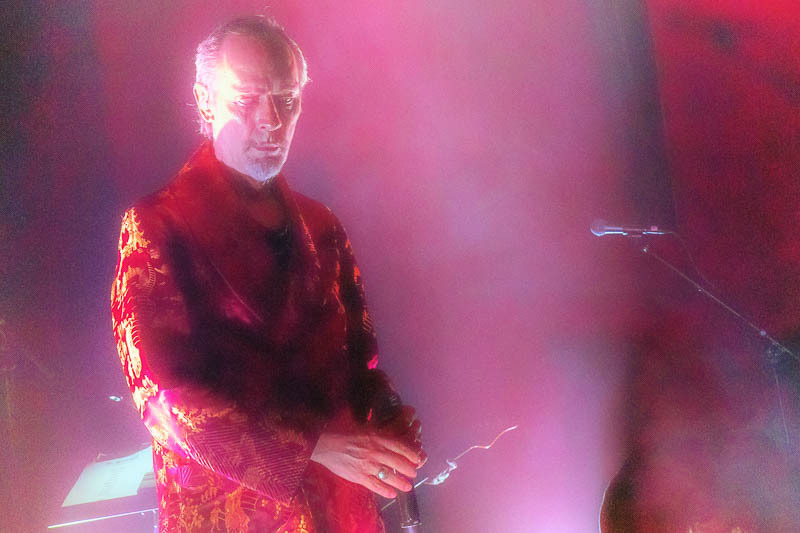 This was the glimpse into the Bauhaus crystal ball that everyone wanted to see, and this was the electricity of Peter Murphy that folks wanted to feel…. until it wasn’t. The remainder of the show was a volatile pendulum swing between of displays of pure rock energy, and rock star divadom. Righting the ship with an incendiary version of ‘Silent Hedges’, Murphy then tried his hand at multi-tasking on ‘She’s in Parties’. Creeping behind Slutsky’s drum kit, Murphy poked at a set of electronic drum pads. When he was either unable to get the sounds he wanted, or couldn’t hear himself, he started tugging on the cords in the back….tumbling the whole thing over. To his credit, Slutsky didn’t miss a beat, and the song continued through the misguided foray of Murphy being a sound man. When he stuck to just singing the effect was very powerful, and Murphy held court in his own inimitable way. He bantered with the crowd while smoking cigarettes and telling stories of his month-long stay San Francisco, then closed the regular set with the dark punk fury of ‘The Passion of Lovers’ and ‘Dark Entries’. The crowd voiced its appreciation loudly but was not yet fully satisfied as the group exited the stage. Stomping the floor to call Murphy and company back out, it was a wonder that the walls did not come down. When they did re-emerge they did so with guest Jill Tracy playing keyboards and providing background vocals on the hypnotic ‘All We Ever Wanted Was Everything’ which was a showcase for Murphy’s still impressive vocal range. To close the night, only one song would be appropriate, but considering Murphy’s penchant for the unpredictable it was no given that ‘Bela Lugosi Is Dead’ would make the set. After a very atmospheric piano interlude by Tracy, she signaled to the band and Slutsky started in with the all too familiar bossa nova beat intro. 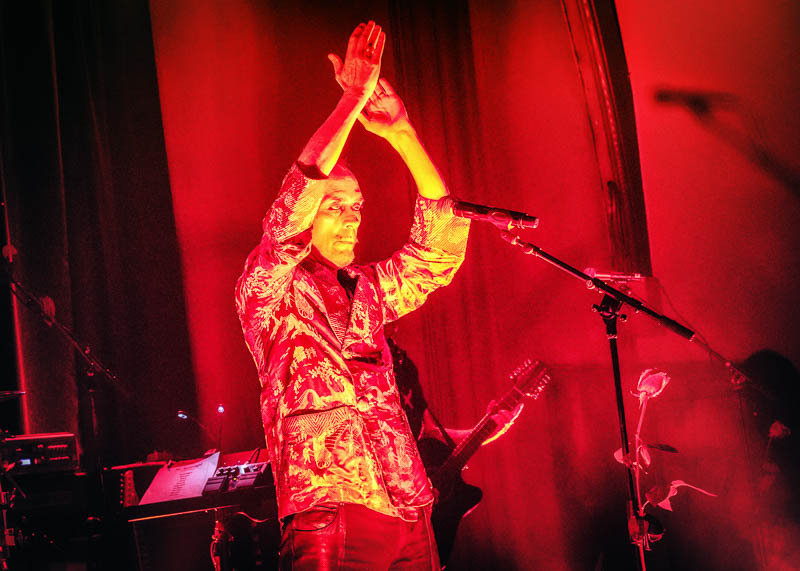 While the audience was rapt, it was at this point that Murphy’s voice turned more into a rasp as he improvised synchronized wails into the lyrics. If his voice was Cinderella’s enchanted coach, it was now turning back to a pumpkin. Ironically it had just turned midnight, and Murphy was done. Leaving the stage as the band built up the tension of the melancholy musical mantra, he would not return, exiting as quietly as he appeared, and leaving the band to soak in the final cheers of the night. Through the hit or miss nature of getting Murphy to the stage, this evening was a decided hit despite his quirky behavior. Intense…yes. A diva…. check. On his terms…. of course. Just a day in the life for Peter Murphy. Stay up to date with Peter Murphy on his website.